Nutrition for dry eye is a subject I discuss with my patients on a daily basis. I have a very large dry eye patient population and have learned what works and what does not work over the last 25 years. I have used the traditional approach using a combination of heating and massaging the lid margins to open the meibomian glands, using a good artificial tear with hyaluronic acid like oasis tears plus or blink preservative free and cleaning the lids with a good lid hygiene foam like ocusoft or cliradex. So for dry eye 3 things are still crucial: cleaning, heating and lubricating. I have also used all the prescription medications available for dry eye over the past 25 years. Since I have become more in tune with the natural approach to dry eyes I find I prescribe medication very rarely now. My nutritional protocol consists of 3 nutritional items I add to my patients. These nutrients not only help decrease dry eye symptoms and improve ocular surface disease but is very good for the entire body. I always recommend two triglyceride form omega 3 fish oils like Fortifeye Super Omega. We have done omega index blood testing with Fortifeye Super Omega proving that two per day dosing in 100% of patients studied under 240 lbs would bring their omega index between 9.2-11%. The goal is to get over 8% to be in the heart healthy zone with omega 3. Studies I have conducted prove that about 1600 mg of triglyceride form omega 3 fish oil is all you need for this. The key is for the fish oil to be in the triglyceride form and not the more common unstable ethyl ester form. The triglyceride form of Omega 3 fish oil is 3 times more bio-available than the ethyl ester form. Omega 3 fish oil is great at helping to quell the inflammation in the eye lid margins and reduce signs and symptoms of meibomian gland dysfunction. I have been very impressed with the additional dry eye benefits we get when we have added 1 Fortifeye Focus pill to the 2 Super Omega. Fortifeye Focus is a combination of 3 carotenoids lutein, zeaxanthin and astaxanthin. This combination is not only great for the retina but has proven to lower inflammatory markers in the body. I have seen arrachidonic acid, c-reactive protein and cortisol levels come down in patients taking just 1 Fortifeye Focus daily. One of the root causes of dry eye is inflammation! The 6 mg of astaxanthin in Fortifeye Focus has also been proven to improve amplitude of accomadation in patients and reduce eye strain and fatigue. Most people with dry eye also exhibit tired fatigued eyes as well. The combination of a Fortifeye Super Omega (2 per day) along with Fortifeye Focus (1 per day) or the equivalent nutrients in another brand work synergistically together at decreasing dry eye symptoms and improving ocular surface disease clinical presentations. Fortifeye Focus works together with Fortifeye Super Omega at helping to reduce dry and tired eye symptoms. So in summary , proper nutrition for dry eye really works well! I recommend a combination of Tg form omega 3 fish oil, lutein, zeaxantin , astaxanthin and a good non denatured whey protein concentrate from grass fed cows. 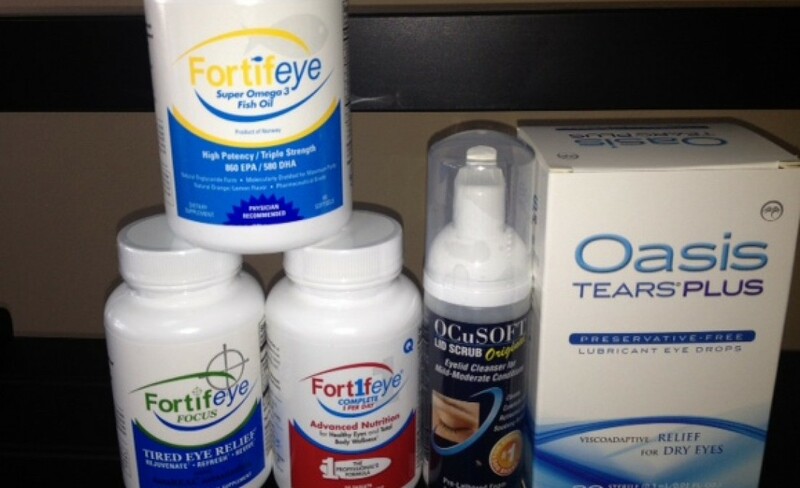 The three I use daily in clinical practice are Fortifeye Super Omega, Fortifeye Focus and Fortifeye Super Protein. Use proper nutrition to help improve your dry eyes and you will gain some valuable overall heath benefits as well. Heres to your health! Tags: astacanthin, cns, deficeint levels of lactoferrin in their tears, Fortifeye super omega, fortifeye super protein, grass fed whey protein, lactoferrin and dry eyes, lutein, non denatured whey protein concentrate, non denatured whey protein concentrate from grass fed new zealand a2 cows, nutrition for dry eye, nutrition for dry eye by michael lange od, proper nutrition for dry eye, stimulate and increase levels of lactoferrin, tg form omega 3 fish oil, triglyceride form omega three fish oil, whey protein, whey protein concentrate, zeaxanthin and astaxanthin | Permalink. Omega 3 for dry eyes. Dry Eye Treatment and Meibomian Gland Dysfunction a Natural Approach by Michael Lange OD. Michael Lange OD discusses Natural Dry Eye Treatment and Meibomian Gland Dysfunction.